A pirate's life is full of longing and potential, and Sea of Thieves has both in spades. I first fell in love with sailing when I was eight years old. My aunt and uncle had saved up for a small dinghy by the name of Tarantine (which I called Tangerine). We sailed it out into the Solent, a strait separating the Isle of Wight from mainland England, where I learned about sail trim, landmarks and how to tie a bowline hitch while the tiny boat bobbed over the wakes of gigantic container vessels, skipping between shipping lanes like a squirrel on a highway. Sea of Thieves is not a perfect sailing sim. It won’t make you tie fenders to the guardrail to save your boat from bashing into the berth, nor will an irate harbormaster refuse to give you permission to enter port while a bigger merchant vessel is leaving. Instead it takes all the joyful, freeing aspects of navigation and rigging and pirate roleplay and leaves you to figure out how to have fun with them. As with many games that rely on exploring expansive worlds and emergent story-telling (partly hinged on other player interaction) Sea of Thieves definitely won’t be for people who want a cookie cutter experience. But for those with a thirst for adventure or a peaceful potter on the open ocean, there’s a lot to like. That range applies to many aspects of the game, which can at once be a meditative experience similar to the trekking back and forth across Hyrule in Wind Waker – that turned so many off the game in its penultimate act – or a raucous, bloodthirsty hunt with up to three friends. Both are special in their own right, and whether you’re sailing solo or with a crew there are plenty of stories to tell at the end of every journey. Your entire goal as a pirate is to earn gold, naturally, which can be spent on various cosmetic upgrades. Your equipment, weapons, clothes and ship can all be rigged fore and aft with all the swagger you’d expect from Captain Sparrow’s wardrobe. Prices range from affordable leather boots around 3,000 a pair, to an eye-watering 70,000 for the starting set of sails. Earning gold is tough at first, you start off only able to complete basic “Voyages” for each of the three factions. These are simple fetch errands for the most pitiful rewards the game can muster. Less than 100 gold apiece for a Castaway Chest retrieved from some beggar’s camp on Penniless Isle. I found that rattling through these missions solo, even after ranking up with each faction enough to buy the good Voyages, was hard going. Solo (or in a pair) you command a sloop, a single-mast ship with every control close to the helm. This sees you juggling duties, shifting the angle and length of the sails to suit the wind and how maneuverable you need to be, and dropping the anchor when you need to jump off or whip a sick u-turn, Tokyo Driftwood-style. If you happen to get into a battle with another sloop it turns comically frantic as you attempt to add firing the cannons and repairing the hull to the already boggling list of duties to carry out. My first encounter with a fearsome player-killing pirate (denoted by the black flag flown from their crow’s nest) saw me putting every ounce of my sailing knowledge to the test in trying to evade and outmaneuver the scoundrel to get a clear shot on him. When I eventually did get him in a losing position, with his ship sunk and out-ranged on a desert island by my sniper rifle he simply logged out of the game, denying me my victory. Yet I still feel incredibly proud of that achievement, and a sense of mastery in the mechanics to protect my cargo while he had nothing to lose. Crew life can be more peaceful, and plentiful. Though a Galleon has two extra masts to handle and another deck to rush down to bail water, with four aboard it can be a well-oiled machine. Defining roles and carrying them out with the helmsman calling the shots can at first feel like trying to drive a car with a different person’s foot on every pedal or lever, but once you all fall in sync, like Pacific Rim’s drift-compatible Jaeger pilots, it’s a wonderful feeling. 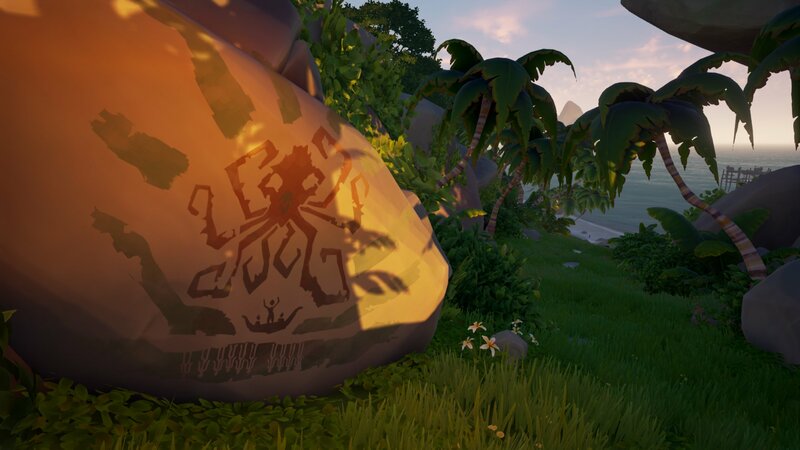 It’s also the best way to make any impact on your pursestrings, as the more difficult missions such as skeleton forts – found by following an ominous skull-shaped cloud over the horizon – will net you an incredible bounty; almost 15,000 gold each. The stress of carrying this much wealth home, through unprotected waters, was almost too much for any of us to bear but definitely worth the trouble. 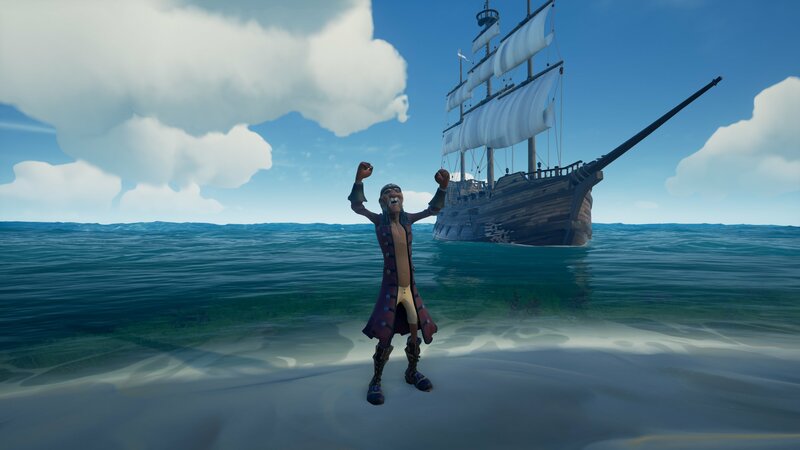 However it still only netted us a paltry couple of upgrades to our wardrobes, one of the more egregious downfalls of Sea of Thieves’ greedy and miserly merchants. A common complaint I’ve seen levied among early adopters so far is that Sea of Thieves feels very much like an early adoption. Not early access in name – or, it must be said, price – but very much so in content, it’s hard to see Sea of Thieves in its current state holding attention for as long as it would take to afford a new batch of sails. I mentioned before that earning solo was a tough slog, and setbacks from cowardly black flags out to take your life and your plunder alike can be gruelling to your psyche after so much work put in. 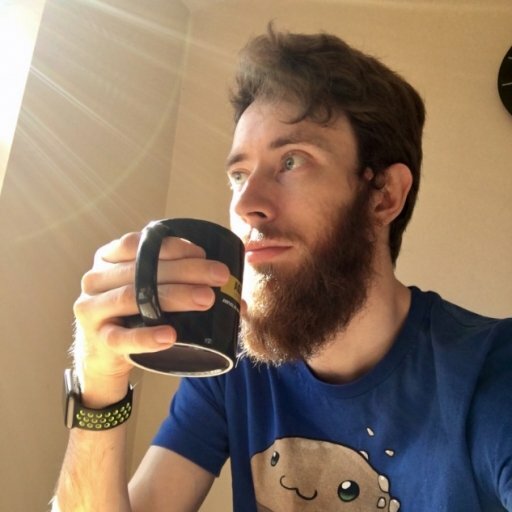 To then look at the meagre number of jackets you can’t afford and will need to spend hours more to come close to that golden sword you want, it is hard not to think of Rare’s “release now, add later” roadmap for the game as a job half done. I won’t deny that when the game is good, it is very good. Sea of Thieves is full of everything needed to spawn lasting anecdotes that even non-players could enjoy being regaled with. And even in its most frantic moments, there is a striking beauty to the world despite its apparent emptiness. Waves build into valleys of water, storms feel epic enough to crack out your squeezebox and riff off a quick Ride of the Valkyries as the rain smashes into the mainsail. Every roll and swell puts me right back into that dinghy on the Solent, dancing in the backwash of those leviathans trudging up the channel. But that yearn for the open water is strongest in the game's quietest ebb. Heading back to port slowly through a headwind on calm seas, after a particularly tricky riddle-strewn scavenger hunt. With the sun just cresting over the waves against a pale pink sky and your shipmate playing "Becalmed" on the hurdy gurdy, life is good. You can almost taste the salt in the air and feel the warmth of the new day’s rays on your chilled bones. A pirate’s life is full of longing and potential, and Sea of Thieves has both in spades.